Blood sugar levels have a huge effect on our moods and overall effect on health. 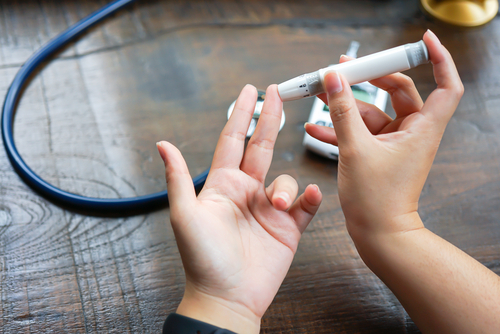 For many people, the thought of being diagnosed with diabetes or pre-diabetes is worrying and it becomes a struggle to keep their blood sugars under control. Naturally controlling your blood sugars can help reduce the stress of them being too high or too low. Hyperglycemia is high blood sugar, and Hypoglycemia is low blood sugar. Both have serious effects on your health and your organs. Blood sugar testing can help find out if you have naturally low or high blood sugars. This is important when you are trying to naturally control your blood sugars. However, before you make any changes to your diet and exercise routine, you should speak with your doctor. Light exercise can lower blood sugar levels, often within minutes. This is a bicycle ride or a brisk walk, not weight lifting or long run. It can take up to an hour after exercising for the effects to start appearing. Strength training can temporarily raise blood sugar levels. However, over time the muscle that you build during weight training will burn glucose more efficiently. For many people, drinking Apple Cider Vinegar is a popular way of controlling their blood sugar levels naturally. In studies, it has been found to help control blood sugar levels in both Type II diabetics and pre-diabetics. If you do not like drinking a couple tablespoons of it, you can also take apple cider vinegar extract supplements. You should take note that apple cider vinegar usually takes longer to lower blood sugar levels than other supplements. However, it is a better preventative supplement than other options. When you are in stressful situations, your body releases hormones that will raise your blood sugar levels. If you start feeling stressed, you should try relaxation techniques like deep breathing and meditation to lower your blood sugar levels. Another alternative stress relieving technique is to go sit in your car or grab a pillow and scream until you feel better. Not getting enough sleep increases insulin resistance in many people, so some people have higher blood sugar levels when they are not getting enough sleep. Lack of sleep and high blood sugar is a vicious cycle because when your blood sugar is high, sleeping is difficult causing your blood sugar to climb. You should try to avoid staying up late or drinking too much caffeine. Eating smaller meals, more frequently throughout the day can help control high blood sugar because it is easier on the intestine, pancreas and the digestive enzymes. Depending on your recommended daily caloric intake, you could eat 4 to 6 meals of 400 to 600 calories. So, you should try to eat at least every 4 hours. You should also try increasing your water intake. Studies have proven that chronic dehydration is hard on the blood, which affects blood sugar and insulin levels. Your thyroid and pancreas work together. When the thyroid is not working properly, it could cause a pancreatic imbalance which leads to insulin resistance. You should ask your doctor about checking your thyroid to see if it is balanced. Typically, women seem to lose their thyroid capability as they age. Expect the unexpected and carry a healthy snack with you. This can help you prevent your blood sugar levels from going too low. It also reduces the likelihood that you will eat unhealthy snacks. Cinnamon may do more than just add flavor to foods. In a 2013 study published in Annals of Family Medicine found that cinnamon is linked to a significant drop in fasting blood sugar levels. This may be caused by increased insulin secretions from the pancreas. While more research is needed, there is no reason why you shouldn’t try adding cinnamon to your diet. It is important to spread out your meals, and you should start your day with a healthy breakfast. For most people, only eating one or two meals a day causes a large fluctuation in their blood sugar levels. So, try to eat three meals and two snacks or four to six smaller meals each day. The best option will depend on your lifestyle and your daily required caloric intake. Dairy is known to increase insulin production by up to 300 percent because of its inflammatory effects. There are many dairy-free replacements available like almond and coconut milk that you can drink to control your blood sugar levels. Just make sure that the option you pick does not contain carrageenan, which can cause gut problems for some people. The Low Fat Myth has been around for decades and has been making our food taste really bad. To make low-fat foods taste better, many food manufacturers started loading them with sugar. The problem is that the extra sugar disrupts gut flora, which can throw blood sugar levels into a tailspin. Don’t be afraid of fats. There are many kinds of good fats that we need in our diets. The culture of convenience is very tempting, hard to break free of, and is making us sick. Most convenience food is full of processed sugars, fats, and salts, which are hard on the gut and can cause high blood sugar levels. Instead, cook your meals at home. There are many tasty meals and snacks that you can make at home and are easy to make. If you haven’t eaten, drinking alcohol can cause a blood sugar drop within the next 24 hours. This quick drop happens because the body is trying to get rid of the alcohol. If you want to drink alcohol, you should check your blood sugar levels first and have something to eat before consuming any alcohol. If you love carbs or cutting them out of your diet is too hard, try spreading them out evenly during the day. This helps reduce the risk of a huge blood sugar spikes. When you keep your blood sugar levels more steady, you will feel less grumpy and hungry. Unsweetened white, black, and green tea can help lower your blood sugar levels within as little as 30 minutes. If drinking tea is not your thing, there are also green tea supplements that have positive effects on blood sugar levels. Fenugreek is a seed used in the production of artificial maple syrup flavors. It is commonly prescribed to new mothers to help increase production of breastmilk. For other people, it also slows the absorption of sugar into the bloodstream. Fenugreek is available in seed form and powder capsules. It is a laxative, so do not take too much at a time. Everyone is different, so what works and what does not will depend on you. This is why it is important to monitor your blood sugar levels and continue using prescribed medications until your doctor advises you to stop doing so.